There was one dog that television personality and bestselling author Rachael Ray just had to meet. "She literally sprinted across the tent to see Tyke," says Brian Gordiski, administrator and events coordinator at Adopt-A-Dog, a Best Friends Network partner group based in Armonk, N.Y.
Tyke, a big, huggable pit bull terrier, was one of five dogs the rescue organization brought to the first Rachael Ray and Best Friends Network partner Pop-Up Pet Adoption Event Friday at a downtown park in Fairfield, Connecticut. "She wrapped her arms around Tyke," says Adopt-A-Dog President Allyson Halm. Tyke bears an uncanny resemblance to Ray's own pit bull terrier, Isaboo. Gordiski says it's obvious the Food Network star is a real animal lover. "She's a really nice person," Gordiski says. "She just loved the dogs and she was just thrilled to be there." Best Friends Animal Society is partnering with Rachael Ray Nutrish, Ray's pet food company, to promote adoptions on Ray's cross-country tour to promote her new book, "Look + Cook." Ray donates proceeds from Nutrish sales to animal rescue groups, and she wanted to use her book signing tour as a platform to promote adoption and animal charities. So Ray and Best Friends Network partners teamed up to co-host Pop Up Pet Adoption Events at her book signing tour stops. At each stop will be a Best Friends Network partner like Adopt-A-Dog with wonderful animals like Tyke who are looking for forever homes, and Ray will make an appearance at the adoption events. 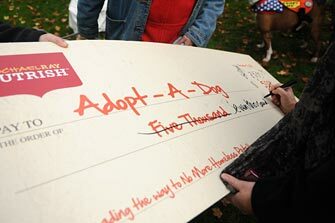 The folks at Adopt-A-Dog got an unexpected surprise Friday when Ray presented them with a check for $7,500. "We were completely surprised," Halm says. "We're so grateful celebrities like Rachael know the need and do give back." Halm says the money will be put to good use. "We have some pretty sizable veterinary bills," Halm says. "We'll end the year with a little less gray hair." Diski says Friday's adoption event was well attended. "The traffic flow was actually quite busy," he says. "It was a great day." Another Network partners-Rachael Ray Pop Up Pet Adoption Event was held Saturday in Bridgewater, New Jersey, where Husky House was the featured Network partner. "It went really well," says Lorraine Healy, founder and president of Husky House. "One of our little poodles was adopted and we received a few applications for our adult Siberians. One was fully approved and they"re coming to pick up their Siberian this weekend. We're also still receiving e-mails from people who saw our dogs at the event and are interested in adopting or volunteering. It was great!" Ray also presented Husky House with a $7,500 check which it plans to put in its medical fund. Meanwhile over at Adopt-A-Dog, they're hoping to see some of their dogs find forever homes, too. They received three adoption applications from people who stopped by the adoption event and could very well receive more. "It happens a lot that people contact us after an event about a dog they saw," Gordiski says. Who knows? Maybe Tyke will be going home soon. Read more about Husky House. Rachael Ray has a web page completely dedicated to animals and animal welfare. Visit Rach's Pets.